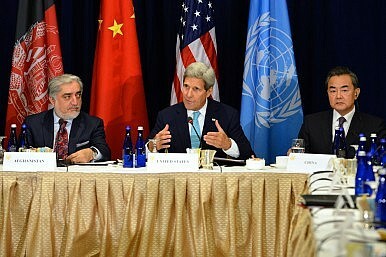 The U.S., China, and Afghanistan held a high-level meeting in New York City ahead of the UN General Assembly debate. As world leaders flocked to New York City over the weekend to participate in the annual UN General Assembly debate this week, the United States, China, and Afghanistan co-chaired a high-level event on Afghanistan. A senior state department official, giving a background briefing to the media after the event, was asked if it was really just a “let’s pat ourselves on the back kind of meeting.” He replied that it wasn’t, saying in a somewhat convoluted fashion that the parties gathered were still paying attention to Afghanistan. The real issue is attention. In 2012, international donors gathered in Tokyo and pledged $16 billion in aid over four years. Next year, donors will gather again–but Afghanistan is buried by a whole host of development and security priorities from Syria to the South China Sea, from Ukraine to Iran. The attention span of world powers and pocketbooks is fickle, especially when it seems few gains have been made and held. Kerry firmly stated that the U.S. has confidence in the National Unity Government formed by Afghan President Ashraf Ghani and Abdullah and although “security remains a grave concern” Kerry reiterated that the U.S. supports an Afghan-led reconciliation process. Developments over the past few months, however, (let alone the news today that the Taliban have taken Kunduz) have certainly thrown into question the future of a reconciliation process. On one hand, Pakistan’s comprehensive commitment to such a process is as much in doubt as it has ever been, but on the other hand, China’s visibility working in concert with the U.S. and the Afghan government is greater than ever before. The lesson from Afghanistan is that we cannot allow radical (sic) and terrorists to violently impose false brands that deny human rights, a legitimate order, and popular aspirations, in the same manner that no state should tolerate or facilitate the use of terror in the pursuit of foreign and military policy objectives. If we fail to do so, nation-states will have a lot to lose. Abdullah directly mentioned Pakistan later in his remarks, saying that Afghanistan and its neighbors, “especially Pakistan,” can do more to push back against terrorist groups.